In this series I look back on my three-week solo hike along the Cape Wrath Trail, Scotland’s most challenging long-distance trail. Along this journey through some of the most difficult terrain the Scottish highlands have to offer, I had to deal with marshy trails, missing supplies, friendly Scots and being completely shut off from the modern world. Read on to find out more! A salt spray greeted my face when I stuck my head out of the ferry’s cabin doorway, the tiny vessel rocking from side to side as it was making its way across the water. The crossing of Loch Linnhe provided a somewhat dramatic start to the Cape Wrath Trail; the longest, toughest and most spectacular part of my trek across the Scottish highlands. After a short ten-minute trip across gentle waves the ferry dropped me at the far side of the loch. I walked down the small, rough concrete pier and started my three-week journey to Cape Wrath, located on Scotland’s uttermost northwestern tip. The Cape Wrath Trail, besides being Britain’s most remote long-distance trail, is also a noticably unmarked trail. There are no signs or posts to show you the way; navigating this trail is one of the things you’ll have to take care of yourself. So for those of you interested in walking to Cape Wrath, it’s time to dust off those map-and-compass skills! Or, you know, get a good GPS device. Crossing Loch Linnhe on the ferry. Yes, the horizon is a bit skewed, you try getting a right angle on a rocking boat! For the sake of integrity and full journalistic disclosure: instead of following the accepted route a bit southward to follow Cona Glen and then head north towards Glenfinnan, I decided to take a shortcut and follow the road along Loch Eil directly westward to reach Glenfinnan on day one. Call me a cheat, but heading south when my goal lay so far north felt a bit counter-intuitive to me. Any moral apprehensions at my decision to take a shortcut were soon overtaken by the satisfaction of finally starting on this epic trail. The scenery around Loch Eil (while not as impressive as the views to come) was imposing enough to occupy my mind with the trials and vistas that lay ahead. Because that is exactly what the Cape Wrath Trail is, a series of trials to overcome, with some of Scotland’s most remote and beautiful terrain as a reward. The trail is not an official one either, not yet anyway. Instead it is a collection of trails and roads that lead hikers from Fort William all along the northwestern coast of Scotland to its end at Cape Wrath: a lighthouse and a few outlying buildings atop a high and storm-weathered cliff overlooking the Atlantic Ocean. 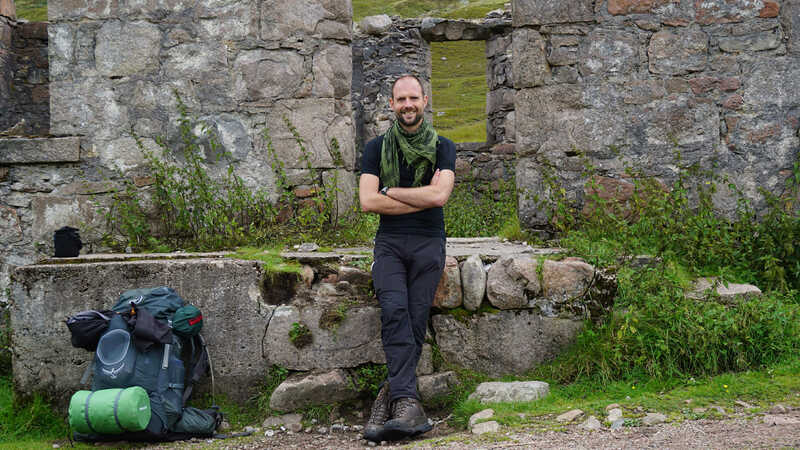 And with the northwestern coast being one of Scotland’s most remote areas, it is up to hikers themselves to carry enough supplies to last at least a week, as there are few opportunities to restock your dwindling food supply along the way. I had no such worries, as I’d already arranged for my food supply to be forwarded by mail to several resupply points along my planned route. The Glenfinnan Viaduct, the first landmark along the Cape Wrath Trail. At the end of a long and (truthfully) somewhat boring walk along Loch Eil’s southern shore I finally reached a point where I could leave the asphalted road behind and start heading north along a proper mountain path. This path led me to pass underneath the Glenfinann Viaduct, a railway bridge made ever so famous by a series of films about a certain nerdy wizard named Harry. A mile or two past this landmark stood my accomodation for the night, Corryhully bothy. What a bothy is? Well, it’s a shelter, a small mountain cabin, if you will. Maintained by the good people of the Mountain Bothy Association, these huts provide a free and dependable way of not having to pitch your tent for a night and remind you of the comforts of having a warm hearthfire crackling beneath a solid roof. As it turned out, Corryhully even had a working power outlet! Corryhully Bothy, a welcome shelter for the approaching rains! The hut smelled like you would expect a place like this to smell: a heady scent of burned wood, smoke and mildew mingled with wet stone and something that hinted at mice. Judging from the many droppings in the corners, I wasn’t far off on that last aroma. With the evening outside turning wet and foggy, I made myself comfortable and started a fire to warm the place a little. While I was putting on a kettle for some tea, the door flew open and let in two people in their early twenties. Wet and cold, they were happy to see the fire burning and they quickly started hanging their wet clothes and shoes near the flames. It turned out they were from Belgium, allowing me to speak Dutch for a change. They happened to come walking from the opposite direction, providing me with some insights as to what lay ahead. Apparently the way ahead was easily traversible, with some pathless but solid terrain after the path reached the high point in the pass above us. A roaring fire, the smell of wet socks and Dutch conversation. Why would anyone prefer a luxury hotel over this? There are many things you learn when solo hiking the length of the Scottish highlands. For example, how to read the weather and know when it’s about to turn bad, or how to avoid the worst of the midge-clouds trying to drink your blood. The day after spending the night at Corryhully bothy I learned how a night’s rainfall can turn a reportedly easy pathless stroll along a solid hillside into a marshy nightmare. To be honest, I was forewarned. The reason why the Cape Wrath Trail is mentioned as one of Scotland’s toughest trails isn’t because of the heights you’ll have to climb. Scotland has its high points, but they’re nowhere as formidable as other places in the world. No, the infamy of this trail lies in its marshyness. Yes, mud and soggy ground will have you stumbling, sinking and slipping across some of the most difficult terrain imaginable. Beautiful terrain, but difficult nonetheless. This I experienced fully when trying to traverse what is known as Gleann á Chaoruinn, a pass following a small stream leading into Glen Dessary. In spite of what my fellow bothy-dwellers told me the night before, this part was soaked through, making the descent slippery and treacherous and turning the grassy hillsides into a soggy marsh. What was supposed to take me only an hour or so now took at least four times as long. I got through, however, and made for more solid ground in the forest beyond. Gleann á Choaruinn looking ominously wet. I had planned on going a bit further and sleeping in the reputably gorgeous seaside Sourlies bothy. But by now I was tired and well behind on my planned itinerary, so I called it a day and stopped at A’Chuil bothy near the other end of Glen Dessary. Here I met a pair of hikers who also just finished the same section, and were looking even worse for wear. Apparently they planned on walking a third of the Cape Wrath Trail, but heavily underestimated the effort. Wearing light shoes and unprotected equipment they were soaked through, down to their maps and cameras. When I entered the cabin they were discussing whether they would continue, or call off their attempt. Looking down at my high, waterproof boots I couldn’t help but feel a little better when faced with their misery; I wasn’t doing so bad after all. But when people are quitting after only two days, what would the rest of the trail hold in store for me? This story is continued in part 2.